An injury to your finger or even a change in temperature or blood flow can cause your ring to become too snug, and no amount of tugging can help. Fortunately, removing a stuck ring doesn't have to be painful and unpleasant. Try these helpful tips to loosen your ring easily and avoid damaging your precious jewelry. 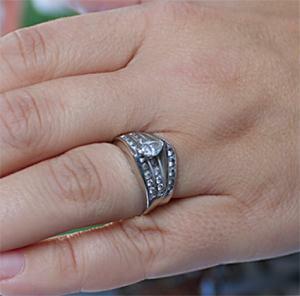 These 10 tricks can help you remove your ring with minimal discomfort. Keep in mind that you may need to combine multiple techniques to get a stubborn ring off of your finger. 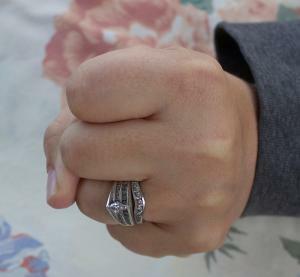 Simply pulling straight back on your ring can cause the skin of your finger to bunch up behind the metal. Instead, slowly work the ring back and forth as you pull. This little wiggle helps your skin adjust as you're pulling and may be all the help you need to take off your jewelry. If you think the problem may be swelling in your hand due to increased blood flow or water retention, elevating the hand above your head can help. Gravity can draw the extra fluid away from your hand temporarily. The American Society for Surgery of the Hand recommends that you hold your hand up in the air for about five to 10 minutes, and then immediately try to remove the ring. Just as heat can cause your finger to swell, a downward change in temperature can cause the blood vessels in your hand to constrict, according to the Journal of Applied Physiology. 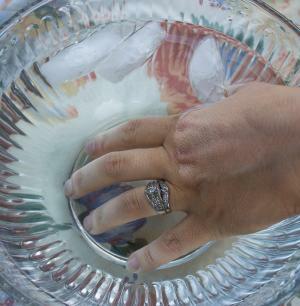 There are several ways to chill your hand and make removing the ring easier. Try placing your hand in cold water for at least a minute or use an ice pack to cool it off. You can even put your hand in the freezer or go outside without gloves on a chilly winter day. Try periodically to see if the cold temperature has reduced the size of your finger enough to loosen the ring. If your ring is stuck, it's easy to start feeling a little anxious. However, anxiety can temporarily increase your blood pressure, according to the Mayo Clinic. This spike in blood pressure can increase swelling in your hand and make it even more difficult to remove the ring. In addition, tight muscles can make the problem worse. Sometimes, all it takes to loosen your jewelry is to get your mind off the stuck ring for a while. Take some time to watch a favorite TV show, read a book, or chat with a friend. After you've calmed down, try again. According to the Mayo Clinic, exercise can cause your fingers and hands to swell. 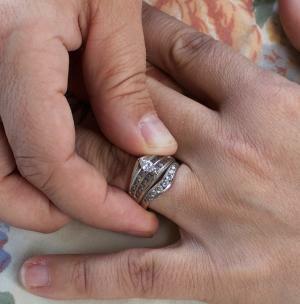 Sometimes, your hands may swell to the point that removing your ring is difficult or impossible. This is due to increased blood flow, and it's a temporary condition. During and after exercise, take a few minutes to move your hands. Swing your arms around and make a fist a few times. Then wait half an hour or so before trying to remove your jewelry. If you wear more than one ring on your finger, it's always best to take them off one at a time. Before you try to remove the rings, it may help to adjust them so there is a bit of skin between them. Then slowly wiggle each ring off individually. The Harvard Medical School recommends using a string to remove stuck rings. Using a thin piece of string, such as some embroidery floss, wrap the finger in a tight spiral until you've covered the area around the knuckle. Pass the end of the string through the ring and then unwind the finger one loop at a time. As the string unwinds, it will work the ring off of your finger. Be careful not to leave your finger wrapped for too long because this can cause injury. According to Patient, edema, or water retention, is usually reduced first thing in the morning and at its worst in the evening. If you don't need to remove the ring immediately due to an injury or other health issue, try again when you wake up. If possible, avoid eating a salty diet the day before you attempt to remove the ring, since salt may contribute to fluid retention. If all else fails and you can't seem to remove the ring with any of these tricks, you may need to have a physician carefully cut the band. You should always have this done if you have injured your finger or if the ring is cutting off the circulation to your fingertips. Many doctors will do this in such a way that you can have a qualified jeweler repair the damage to your ring. Some ring removal tricks are not appropriate for loosening stuck rings because they can lead to damaged jewelry or even painful injuries. Do not try the following methods. If your ring has an elevated setting, in which the gem is raised above the ring shank, do hang on to this part of the ring when you pull. Pulling on the setting can warp or bend the metal and loosen the prongs. This could result in your gem falling out or your ring becoming severely damaged in another way. Sometimes it can be difficult to get a secure grasp on your ring, but don't resort to using pliers or other tools. The metal in these tools can permanently scratch or chip your jewelry. While a doctor or emergency medical professional may cut off your ring, don't attempt to do this yourself. If you're facing an emergency situation, call for help. Do not try to cut the metal in the ring, since it's too easy to injure yourself while attempting this. Once you have removed that tight ring, it is important to prevent it from becoming stuck again. Keep these tips in mind to help. If your ring style allows, have the ring resized by a jeweler. Adding just a small amount of metal to the back of the ring will give you the extra room you need for a comfortable fit. If resizing is not an option for your style of ring, consider wearing the ring on a different finger or passing it to a cherished relative as an heirloom. If you know your ring was snug because of a temporary change in your body, such as pregnancy, take a break from wearing your jewelry during this time. Alternatively, you could wear your ring on another finger or on a chain around your neck. If a tight ring is just a temporary occurrence due to heat or exercise, try to avoid the circumstances that led to the problem. Remove your jewelry before exercising, using a hot tub, or taking a warm bath. Although it's not a fun experience, a too-tight ring isn't a cause for panic. Relax, be patient, and try a few of these helpful techniques, and you'll eventually be able to slip that ring off your finger.